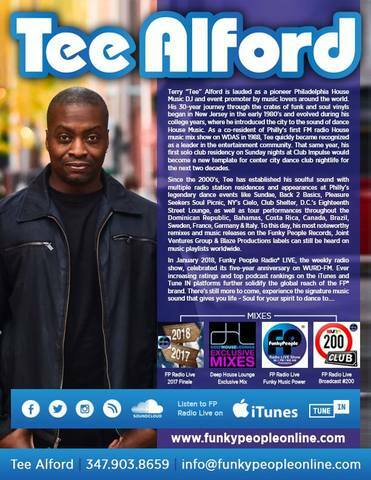 Terry “Tee” Alford is lauded as a pioneer Philadelphia House Music DJ and event promoter by music lovers around the world. Tee quickly became recognized as a leader in the entertainment community. That same year, his first solo club residency on Sunday nights at Club Impulse would become a new template for center city dance club nightlife for the next two decades. as well as tour performances throughout the Dominican Republic, Bahamas, Costa Rica, Canada, Brazil, Sweden, France, Germany & Italy. Joint Ventures Group & Blaze Productions labels can still be heard on music playlists worldwide. In January 2019, Funky People Radio® LIVE, the weekly radio show, celebratea it's six-year anniversary on WURD-FM. Ever-increasing ratings and top podcast rankings on the iTunes and Tune IN platforms further solidify the global reach of the FP® brand. Last edited by robbi : 01-08-2019 at 11:18 AM.